Have you been introduced to Jeni’s Splendid Ice Creams? No? Well, me either. At least not in person. But I do have her cookbook, Jeni’s Splendid Ice Creams at Home. And I love it! And surely, one of these days I will get back to Columbus, Ohio, where I spent four years of my life, and actually check out some ice cream first hand. Until then, at least I have her cookbook. I love that her base recipe does not require you to make a custard by tempering eggs – something I am apparently not very good at – I always end up with a bit of scrambled egg in mine. And I love that her flavor combinations are so unique. So far I have made the Lemon and Blueberry Frozen Yogurt, Pineapple Piment D’Espelette Sorbet, Sweet Corn and Raspberry Ice Cream, Goat Cheese with Roasted Red Cherries and Salty Caramel Ice Cream. All have been wonderful! The creamy texture. The richness. Truly, you only need a little bit of this decadent ice cream. The verdict – wonderful, of course! Especially with a bit of chopped chocolate on top = Mocha Kahlua Chip! So didn’t you just love what you saw? Imagine if you gave some of her recipes a shot… Well, I did this past month for the monthly Adopt a Gluten Free Blogger event started, and hosted this month, by Sea over at Book of Yum. This is my very first adoption and I enjoyed it thoroughly. The only problem was choosing which of Jenn’s delicious recipes to try! So I tried a few….more like four. Oops. Oh well, we needed to eat, right? But first, more about Jenn and The Whole Kitchen. Jenn is a dynamite, creative and intuitive cook as well as a wonderful photographer. She is married, lives in Chicago and works for the American Cancer Society. She is also a runner, like serious running, marathons and stuff. Stuff I don’t do. Jenn cooks gluten free, of course, but not vegetarian, although she still has some great ideas that can be easily adapted. Jenn was not formally diagnosed with celiac disease but she still knows that gluten is her enemy. Be sure to read about her amazing journey and successes over the past eight years here. We have enjoyed getting to know one another and have connected over a couple of things; first, she lives in Chicago, from where I moved; second, she grew up in Ohio and with a family that foraged for wild foods like mushrooms and nuts, also like me; third, she loves ice cream (like me) and encouraged me to buy my ice cream maker(! ), and lastly she loves great food! First off, we had a good crop of butternut squashes from our garden this year. This was the first year I have grown them but they grew well here in our heat and although they were a tad bit smaller than the ones you find at the grocery, they are great. 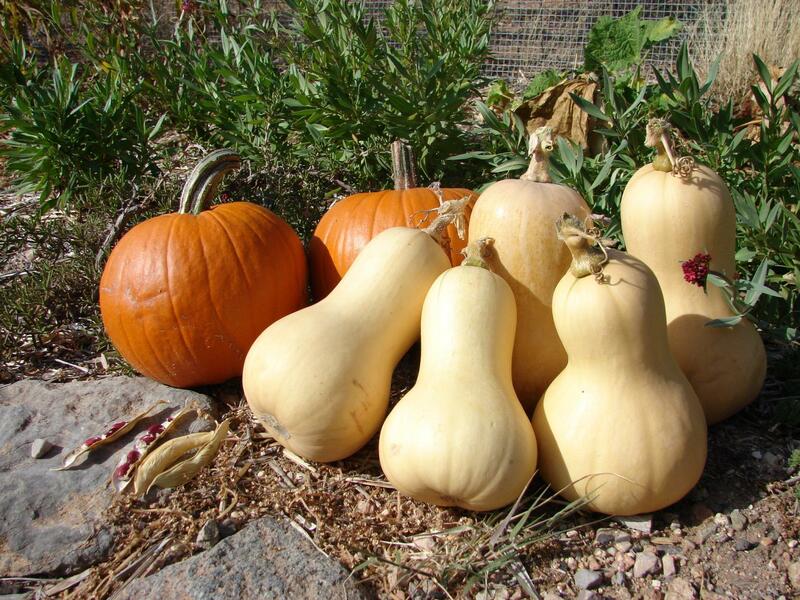 The pie pumpkins, butternut squash and last of the Anasazi beans from our garden. Since I had a couple of these buggers lying around, I figured I should make soup. I chose Jenn’s Roasted Butternut Squash Soup. It was lovely, although I think I used too many carrots since I was using up the baby carrots in the frig and it was a bit carroty. But still wonderful. And just as good was the squash, freshly roasted with rosemary, cooling on the stove. Yum. I couldn’t keep my fingers out of it. I also made some Bisquick biscuits (first time) to go along with it and they were pretty good too, although a bit crumbly. 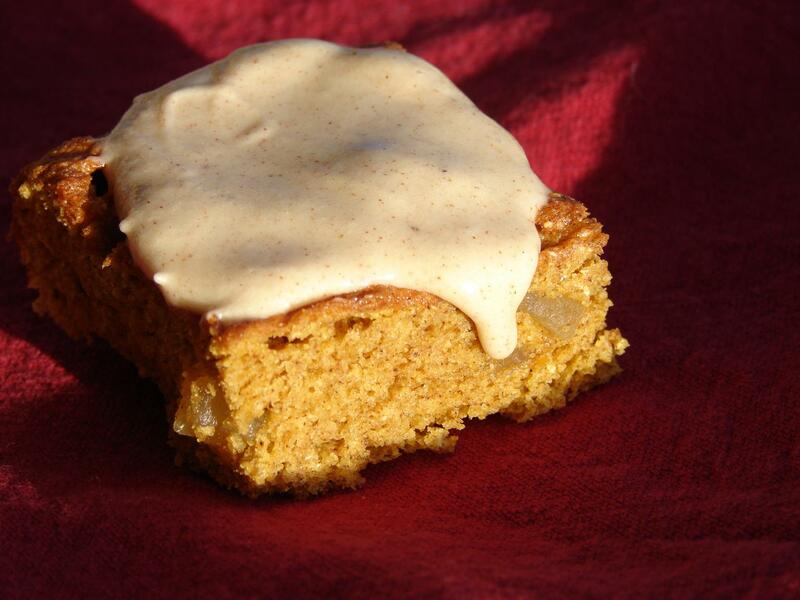 Next up, I had been eyeing the Pumpkin Spice Bars she had made recently. Wow! These were wonderful. And we loved the added bits of ginger. I had to take half the pan to a friend because I knew how dangerous they would be sitting on my counter. And I agree with Jenn too that I only like a smear of frosting. Even though she halved the recipe on her page, it was still a lot of frosting, although delicious, and so my husband is telling me that I will have to make some more bars to go with the frosting! And also because he ate the last one today and I was thinking of it on my drive home from work only to find the pan washed up and the last one missing… The bars would also be delightful without any frosting at all. Recently, I had asked if anyone had any good recipes for Anasazi beans. We grew some this year as you can see in the picture with the squash, and I picked up a bag at the Farmer’s Market this fall. Beautiful beans. Unfortunately their beautiful colors don’t stick around during cooking. But as I was browsing through The Whole Kitchen’s recipe index, I spotted a recipe that sounded good and used a similar bean, Good Mother Stallard beans. A Potful of Beans. Indeed. The Anasazi beans were a great substitute. We omitted the bacon and I added a bit more olive oil since there wasn’t any bacon fat to saute the onions in. I also didn’t have Mexican oregano, so I just used regular old oregano. I also added a couple drops of Liquid Smoke to impart some of the bacon-y flavor and smell. It worked. And the smoked paprika added depth as well. These were a tasty treat this week, now that it is starting to get a bit chilly in the evenings. 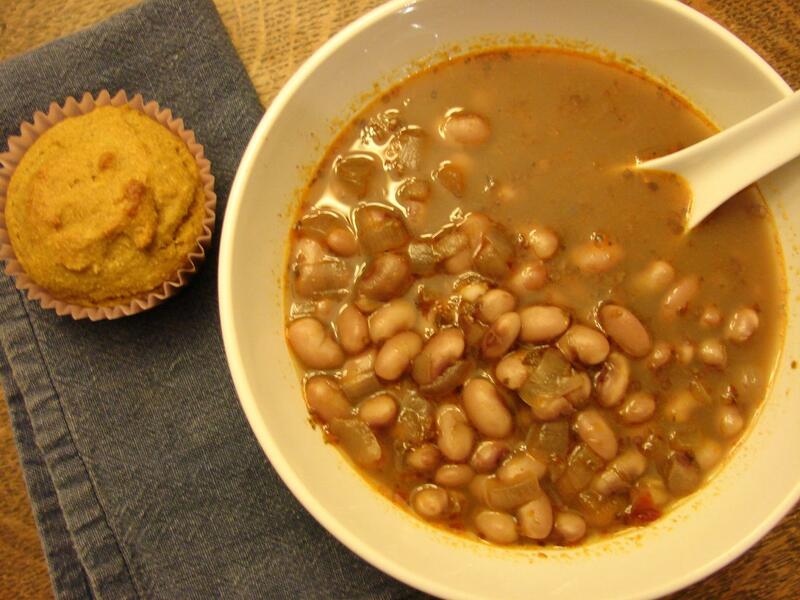 We ate the beans as a meal with some pumpkin corn muffins. 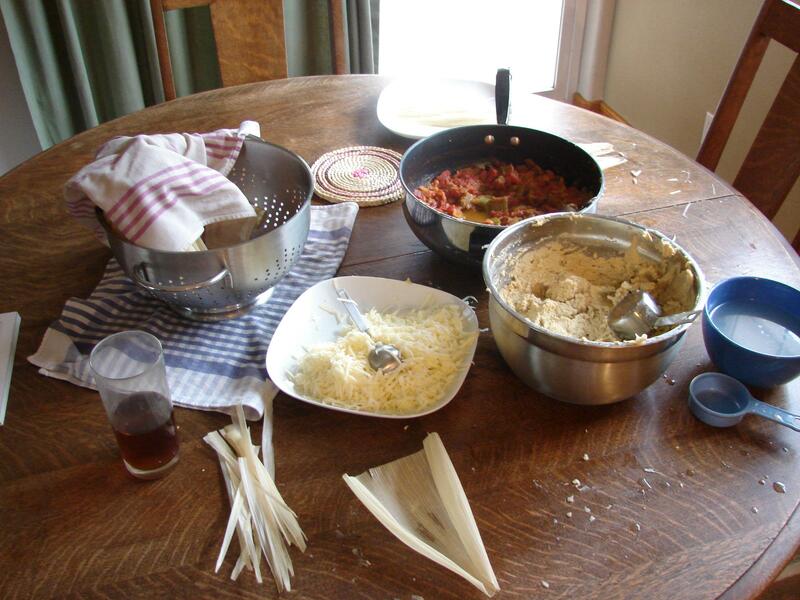 We will be making this again. And although it is getting chilly, we still like our ice cream. 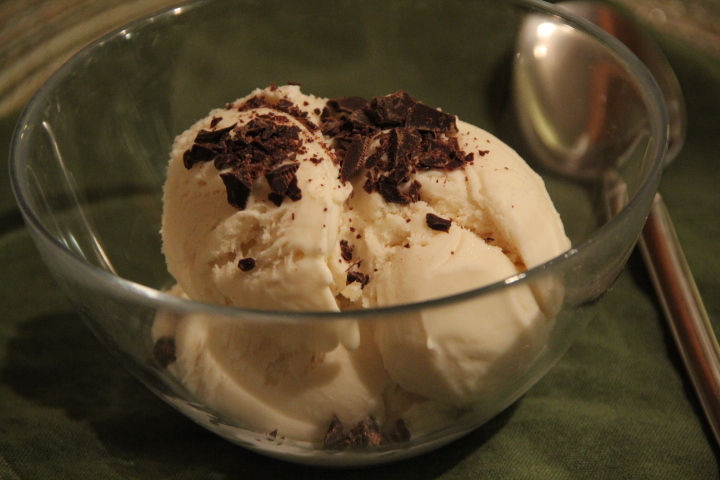 And since Jenn convinced me that I ‘needed’ an ice cream maker, I knew I had to make one of her ice creams. 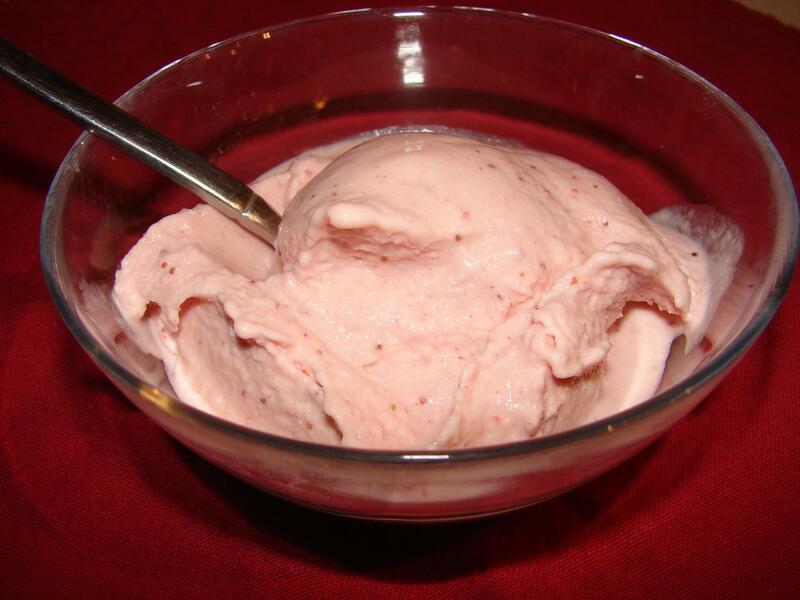 Although strawberries aren’t in season, frozen strawberries work almost as well, so we made Jenn’s Strawberry Cheesecake Ice Cream. I have also made some of Jenn’s other recipes, although not as part of this event. Mushroom and Leek Pasta and Thai Curry Coconut Butternut Squash Soup. Of course, these were also delicious. Mushroom and Leek Pasta made earlier this year. So I hope you’ll go on over and check out The Whole Kitchen and try some of her delicious creations. Enjoy! Last week’s meal plan got derailed by a trip to the Farmer’s Market as well as time to finally make something we’d been wanting to make for a while now – tamales!!! About a year ago we bought the book, Tamales 101 by Alice Guadalupe Tapp. We have both read through it multiple times and drooled over the recipes. Last Christmas, we thought we might make them but I don’t have a stand mixer and the mixing of the masa by hand was a bit intimidating. 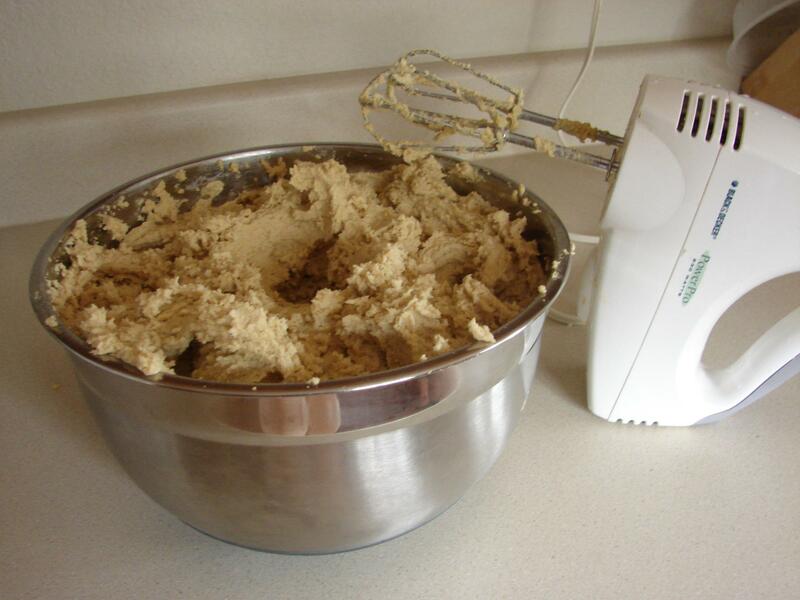 But I knew that other people make them without, it was just an excuse for a mixer! But still I refrained from buying one and so we didn’t make them. Finally, when my in-laws were here a couple of weeks back we thought we might make them then since four pairs of hands seemed better than two. But we ran out of time. So this weekend, my husband was determined. 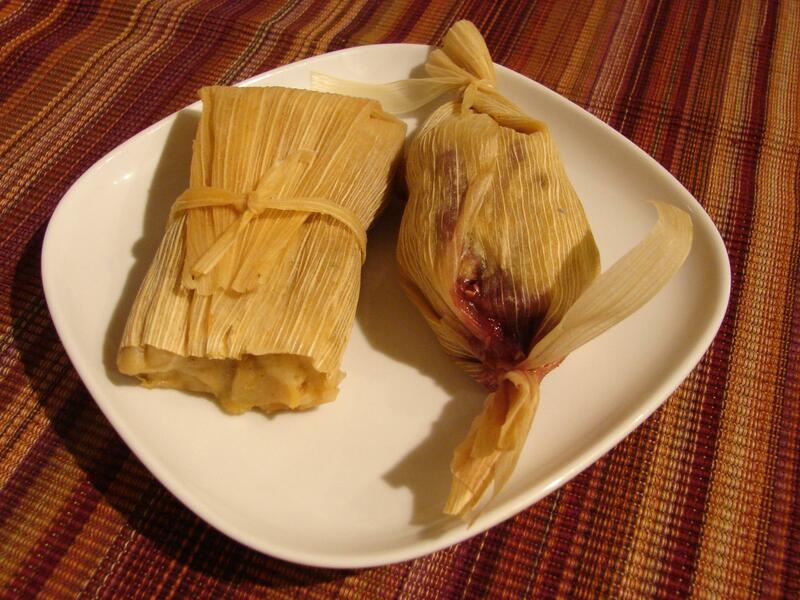 We made two kinds, Green Chile and Cheese (vegetarian) tamales and a dessert tamale, Raspberry Chocolate pecan. They were both wonderful!!! Both recipes were from Tamales 101. It’s a great book. And it isn’t really very hard, once you get the hang of it. My handy-dandy hand mixer also managed the challenge just fine. Here are some photos for your drooling pleasure. A giant bowl of masa. 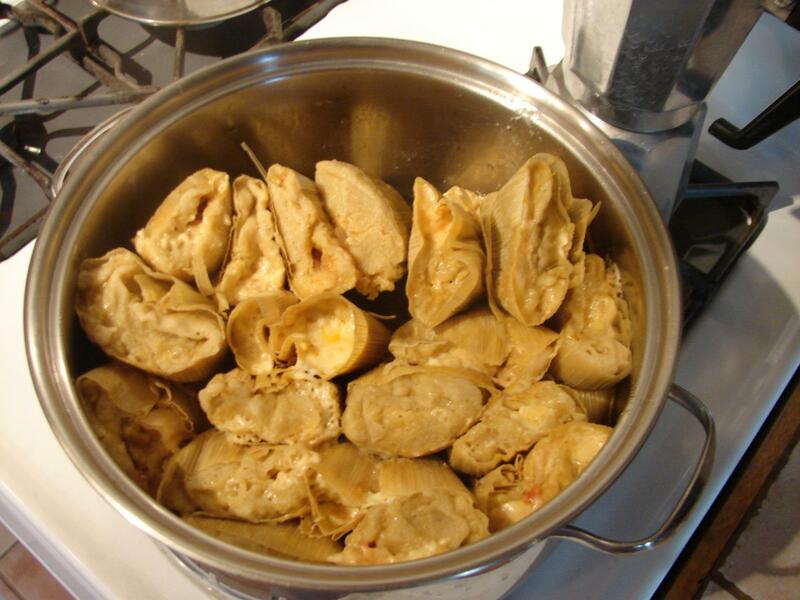 Green Chile and Cheese tamales steaming in the pot. Green Chile and Cheese on the left and the Raspberry Chocolate Pecan on the right. Between that and trying to take care of the things in the frig that needed to be eaten or ‘dealt’ with and impulse-buying at the farmer’s market, I really don’t need to buy much at the grocery tomorrow. 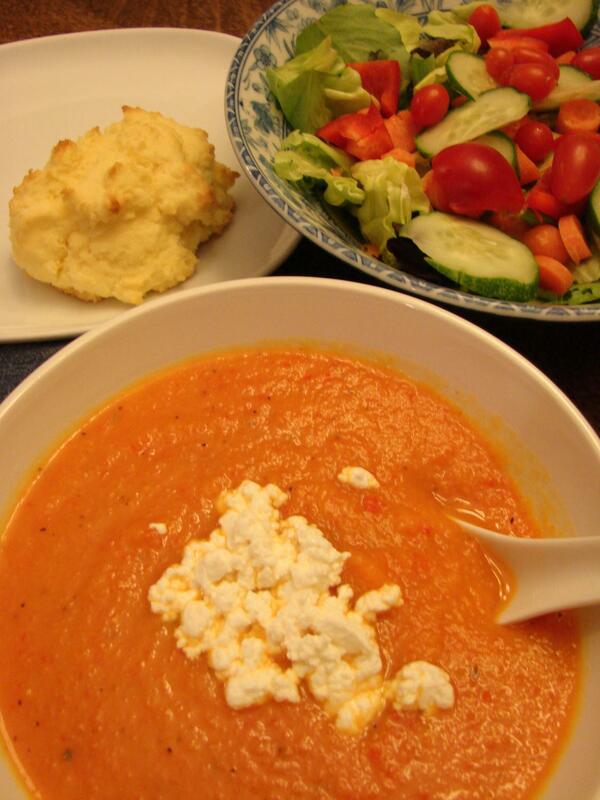 Also, this week, the Gluten Free Menu Swap is being hosted by Celiac Family and the theme is tomatoes! Who isn’t eating tomatoes right now? It’s prime time. Last week I made white bean gazpacho with some of my tomatoes. I wish I had more tomatoes coming on than I do but we have been struggling with pests this year and both of my big, beautiful San Marzano paste tomato plants are slowly dying. But our Black Russian and Stupice varieties are beginning to come on. So we’re still hoping for more tomatoes, I just wish it was the San Marzanos. At the farmer’s market I picked up some more beets, some okra, oyster mushrooms, leeks, tomatillos, three different kinds of fingerling potatoes and some cute little Japanese shishito peppers. 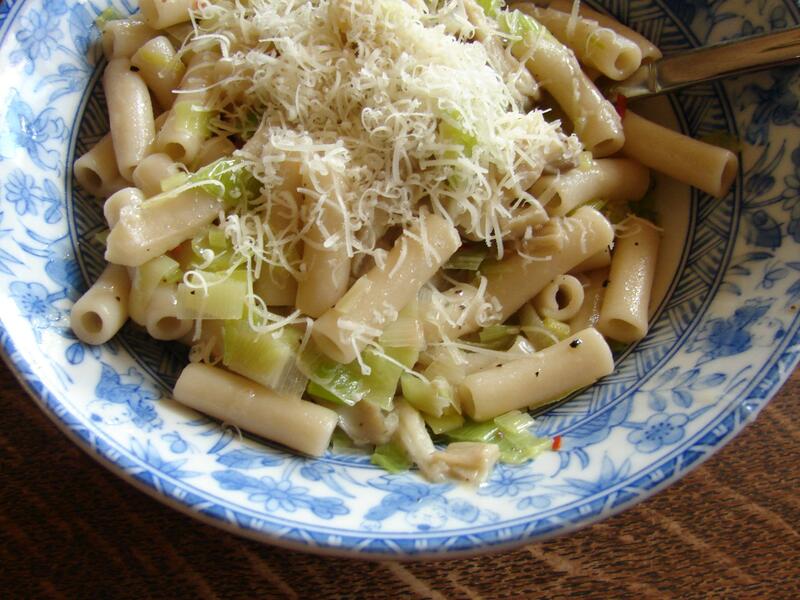 Mushroom and Leek Pasta with Salad – we made this tonight and it was delicious. I used the oyster mushrooms and leeks I picked up at the farmer’s market. Thanks for a wonderful recipe, Jenn! Cucumber and Avocado Soup, Sauteed Fingerling Potatoes, Oven Roasted Okra – the soup never got made last week as my avocados were not ripe. But I still have plenty of cucumbers! And thanks to Amy at Simply Sugar and Gluten Free for the idea of roasting the okra. Our very own tamales with shishito peppers and tomatillo salsa – I will fry the peppers in very hot oil and sprinkle with salt. And we will roast the tomatillos with some garlic and onions and make a salsa out of them. Great for dipping the tamales in! As for desert this week, we still have homemade vanilla frozen yogurt, David Lebovitz’s cherries in red wine sauce, Shirley’s honey cinnamon ice cream and of course, the raspberry chocolate pecan tamales. So there is probably no need for additional ice cream this week. If you are looking for any more meal ideas, be sure to check out OrgJunkie and all the ideas over there (most are not gluten free or vegetarian).